I recently got a new phone, which is a Pixel 2 XL and I've noticed I never receive push notifications for when an alert is thrown out in the app. I have had no issues with any other app throwing push notifications and have not modified any settings in how notifications are displayed on my device. I am on Android v 9.0 currently if that matters. Please doublecheck the settings (permissions) for the Pulseway app. Is it possible that you have selected the settings not to allow the Push notifications when you were asked about it after the installation? Also, please check the Pulseway app settings to see if these options are enabled. If you want to reconfigure the Pulseway app on your phone, then please delete the storage for this app and reconfigure it. Which version of Pulseway are you on? I've had this problem but only since being migrated to 6.0, now I get email notifications which I don't want and is turned off on the web app, and I no longer get push notifications which is turned on, tried toggling the options but no change. Don't know if you managed to solve this but I recently had the same problem and it turned out that my phone had been deleted from the authorised devices in the Pulseway webapp, simply rebooted my phone and it re-registered with the webapp and started receiving notifications. Please make sure that the Push notifications are enabled for your account. 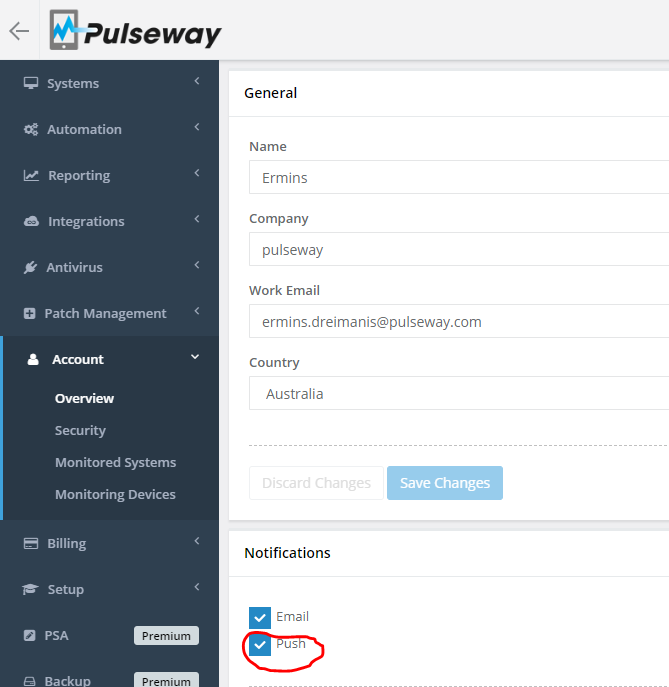 And if this setting is enabled then delete the storage for the Pulseway app on your phone, delete the device registration from the Pulseway WebApp and then reinstall the Pulseway app and configure it. I've just found out that this is a more wide spread issue as it's affecting other apps as well. It appears to be due to an update: https://productforums.google.com/forum/#!topic/phone-by-google/Nfqx7JT0J9g. Go to Battery – Settings (three vertical dots) – Battery Optimization, open the All apps section from the drop down menu, go to Pulseway, and tap on “Don’t optimize.”. Let me know if this resolves the issue. I'm having this same problem. Setting the app to 'Don't optimize' did not resolve it. Also enabled 'unrestricted data access' and all notification settings are on (Allow interruptions, on lock screen, override DO Not Disturb). I've had multiple times(in the past couple weeks) where things have went down on my server and I haven't received a single notification. It started when I got a google pixel and installed pulseway. I've tried uninstalling and reinstalling, doesn't resolve anything. Also wasn't prompted for any permissions. I've been using Pulseway for like 3 years now, but it's feeling really buggy right now. This isn't the case. That post is from 2017. Current version of Android is 9.0 and in 2017 it was 8.1. Indeed. I posted on another thread because I never got a reply from a pulseway employee. Apparently they acknowlege the issue, but they aren't getting a reply from their app devs. Obviously a big disconnect between support and their outsourced app developers! I'm also having the same issue. I've had the app for years and recently switched from a Pixel 2 XL (running Pie) to a OnePlus 6T (running Pie). I no longer get notifications. I have checked both the web app and the settings on the phone. Nothing helps. Honestly, the value of the service is greatly diminished without notifications. Is Pulseway going to address this? ﻿﻿﻿ Is Pulseway going to address this? Their response has been that it is a bug... WITH the OS itself. Not the case. If that were the case my push notifications would be broken on all of my apps (and that is nowhere near true) Pulseway is the only app with this issue on my phone. This does nothing. still no notefications ! Please adress this problem, just missed a larger problem i out setup, due to no allerts... i cannot relay on the app if this doesent work ! We've released an update to the Android app into the beta channel (you can enrol here) that fixes this issue. Thank you for your support. Can you check in the WebApp under the Account -> Devices to see if the phone now displays Yes under the Push Notifications table column? But does it show a 'Yes' under the Push Notifications column? I have removed the Pixel device registration from your account. Please open the app again to have it register again, you will get an email to confirm that the device was added to your account and then you should trigger a notification to see if you get it. It would be nice if we also can monitor/manage the smart devices like Android and IOS. I have several non-critical virtual servers that do not start automatically with our Hyper-V cluster that I want to start manually once I know all critical servers are back on line after a cluster reboot, but these do not show up in the list of VMs for each host on either the Android or PC app. I only see the 'running' VMs. Am I missing something in config of Pulseway Manager (v5.4.7) other than just enabling 'Monitor and Manage Hyper-V'? According to this page https://www.pulseway.com/hyperv I should see all VMs configured on a host, and be able to do lots of other things. From your PSA overview video I see you have the philosophy of moving away from device applications and concentrating on HTML only for the PSA platform. However, one of the advantages of, for example, a CRM app on my android phone, is that I can call up a contact and I am able to launch my sat nav application with the contacts details already filled in. I don't see a way to do this with the PSA. Looking at the number of posts here I suspect there hasn't been a great takeup of PSA? Is there anyway to show the last 3 scripts that have been ran on a system. Perhaps right below the run automation scripts. Nothing too detailed, but per system it would be nice to see what's been ran recently maybe title of script ran date and complete or failed status. At the moment we use Windows Dashboard 5.1.2 to monitor configured systems during office hours. As not all customers are under the same SLA, we don't need all notifications at all times. Outside office hours our support staff is mobile and would like to use Pulseway Android App to receive notifications on problematic systems. But unfortunately there is no option to include or exclude groups, tags, roles or scopes. And there is no way to tell the app just to show critical notifications. Are these features already planned for a future release of Android App?